Fiber Flux: Free Knitting Pattern...Very Violet Newborn Hat! Free Knitting Pattern...Very Violet Newborn Hat! This sweet little newborn hat was created to raise awareness for the Click for Babies program. The program's mission is to teach people about the period of purple crying...those first few months known as the "purple period" when babies don't ever seem to stop crying and how it can lead to Shaken Baby Syndrome. There is a wonderful group of folks knitting and crocheting hats to donate to hospitals where they are then distributed to newborns and their families in hospitals along with informative booklets...the purple color is to remind parents that the "purple crying period" of their development is perfectly normal during a time when caregivers may get frustrated with long periods of crying. *Instructions included for flat and in the round. Break yarn leaving a long tail. Using a tapestry needle, thread through the remaining stitches and pull tightly. Weave in ends. Break yarn leaving a long tail. Using tapestry needle, thread through remaining stitches and pull tightly. Seam up the back of the hat. Weave in ends. Stitch bloom to hat and weave in ends. Check out more free knitting patterns here! If big sister needs a hat, here's a matching hat for her too! 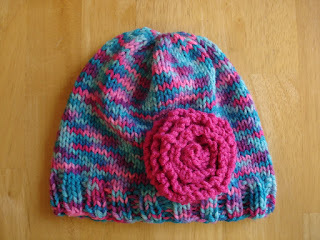 this is a nice hat:) i am also falling in purple phase, made a crochet drawstring bag. have a lovely day! Thanks!! I saw the bag on your site...super cute, love it! Great hat for a wonderful purpose. Great job Jennifer. Thanks...just saw your flower scarf...love it!!! I'm just getting back to knitting after a very, very long break -- so I understand all the directions except :KFB, which means? What does KFB stand for?? I just made this and because I tend to knit large it will fit my 1 yr. old granddaughter. It's a lovely and easy pattern and I will certainly keep it as one of my favorites. I accidentally knitted the hat 6inches instead of 5.5. I don't want to take out .5inches.. so is there a way to decrease the hat faster? I don't want it to have a long top. Thanks!